While browsing through Facebook this morning to catch up with what my friends are up to, I came across this great song (to the tune of Onward Christian Soldiers). Acknowledgement and thanks to Thandeka Dintlhe for the words. 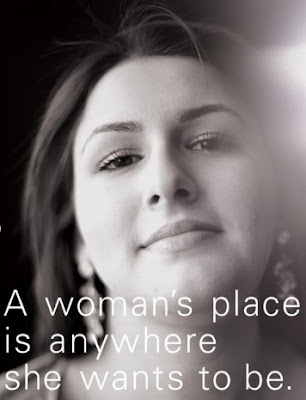 The picture comes from an ad for a US-based Christian women's employment agency. Onward Christian Women, God has chosen you. Much of Christian Service only you can do. Giving life and comfort, dying human tears. Onwards Christian Women, hear God's call today. Yours in love to follow, Christ will lead the way. Any talented person out there up to writing some extra verses?